Dream. Struggle. Victory. Repeat. 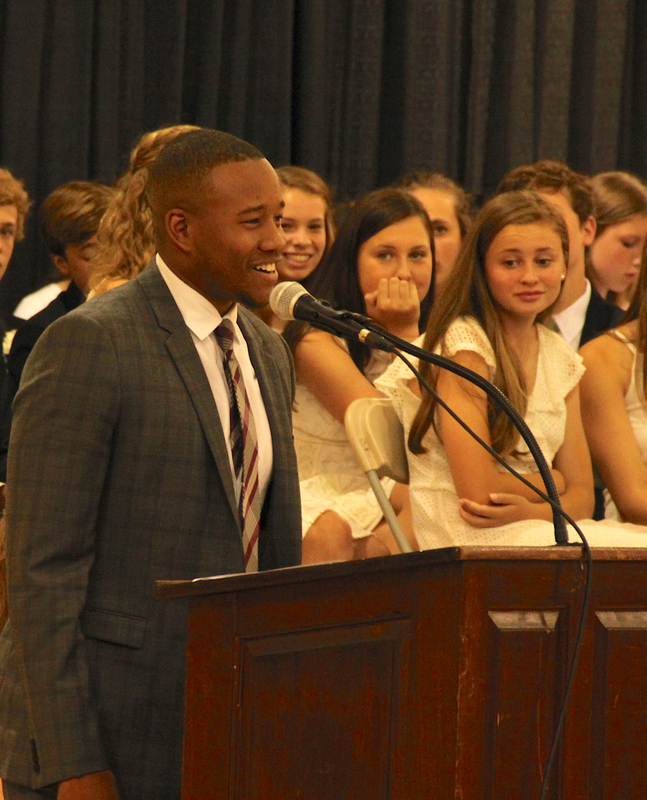 Chase Minnifield ’04 Inspires TLS Graduates. JUNE 1, 2018: Chuck Baldecchi Introduces Chase Minnifield ’04 as Commencement Speaker. Twenty-five years ago, when Chase Minnifield ’04 first walked into the prekindergarten classroom of Mrs. Beers, he was not envisioning himself ever giving a commencement address. Rather, this four-year-old’s focus was learning how to negotiate circle time, forming a line, and getting through the halls of TLS. He will be the first to say The Lexington School education has served his sister, Chanel Minnifield ’06, and him well, and has since helped him navigate many corridors in life. From TLS, where he was a member of the last ninth grade graduating class, he matriculated to Henry Clay, then to the University of Virginia, earning his degree in sociology and becoming one of the nation’s best cornerbacks on the Cavalier football field. He then took his athletic expertise to the NFL, playing three seasons for the Washington Redskins. He also has his master’s in Sports Administration from the University of Louisville. Chase’s parents, Diane, former TLS trustee, and Frank, Cleveland Browns cornerback and member of the NFL 1980’s All-Decade Team, join us this morning as well. A self-confessed highly competitive youngster, Chase remembers with clarity countless lower school afternoons when he and best friend, Chris Floyd ’04, slipped into the Little Gym. It provided golden opportunities for dunking baskets, since the Big Gym goals were way too tall for them back then. Recess games of four square evoked high emotion too, so much so that one memorable Friday Chase had to visit Ms. MacCarthy, a first – and probably last – for him, and a very big deal. He recalls, “I’d never been sent to her office before, and I was pretty nervous. Ms. Mac was very kind and understanding though, and she said, ‘Chase, this isn’t like you.’ I said, ‘I let my frustration get the better of me,’ but – and here’s the kicker – I had to tell my parents. All weekend I was waiting for the right time, until it was finally Sunday, and Mom was ushering in church. When she passed the collection plate, I told her then, so it’d be a quick interaction.” Chase doesn’t offer that as a best example of confession, but he knows, first hand, the importance of being an honest, responsible, and reliable man. With his entrepreneurial spirit, Chase is a leader in our community. He is the founder of two businesses, Helping Hand, an apartment service provider for college students across America, and EZ Turn, a tech start-up, based here in Lexington, providing technology solutions for housing, both on and off campus. The EZ Turn App is used on multiple campuses, including the University of Kentucky, and in multiple states, from coast to coast. Additionally, the Minnifield Foundation, his non-profit to “encourage, uplift, and inspire youth through academics, athletics, and the arts,” is known for its hugely popular Superbowl Superbashes. Chase Onassis Minnifield – The Lexington School’s only alum named after a bank and a Greek shipping tycoon – let’s all give him a warm and enthusiastic welcome back to his alma mater. JUNE 1, 2018: Chase Minnifield addresses The Lexington School. It’s a pleasure to be back! The Lexington School and all it offers has a huge place in my heart. From the teachers, to all the students, to all the parents, it was such a great experience that I never really appreciated until I look back on it, but The Community at The Lexington School is a community to be proud of and to appreciate. When they say it takes a village to raise a kid, The Lexington School community was that for me – from discipline, to character, to responsibility, I truly believe I wouldn’t have been the person I am today without the TLS community. So I say thank You, and thanks to my mom and dad for making the great decision to entrust my sister and me to grow up in this community! I’m forever thankful and grateful! For the graduating eighth graders! I come to you today and I remember the time I was in your seats thinking, man I can’t wait to get out of this school, but at the same time wondering what was going to become of all the friendships I had built here at TLS since we were all going our separate ways from public schools, to private schools, to boarding schools. And we didn’t have social media then, so now it may be easier to keep up with everyone, but back then it was really a question for me and for my peers. Well, I’m here to tell you, these friends you have here today that you have built bonds with, friendships with – even you all that maybe have not got along every day or have many differences with – you will forever be connected through your experience at TLS, and these people sitting next to you will forever be your family, no matter how long you go without speaking or if you speak every day. When you see one another or run into one another, it will be like you are still sitting in Ms. Bonzo’s class or studying in the hallway for a last-minute exam, and it goes on and on – all the experiences you have shared together. This time spent will forever be a part of your journey and story that only these people understand. Through my companies, I do a lot of traveling to multiple different areas of the country, and wherever I am, I try to meet up with any of my TLS friends. I was recently in LA and had a mini TLS meet-up with Chris Floyd, Katie Simpson, Julie Burchett, Colleen Gross, Katherine Bandoroff … and we are all best friends and will always be best friends! So as you guys enter your next phase/chapter of life, don’t forget all the things this amazing community has taught you, from discipline and character to respect and vision. You have been equipped with everything you need to go be successful, not only in this next chapter of life, but in life in general. From my time at Henry Clay High School, to UVA, to the Redskins, to now, creating two companies and a foundation from the ground up, the tools TLS equipped me with still remain the foundation of myself and my success. Dream! I want you guys to dream big, dream so big that it’s scary! I always had dreams of playing in the NFL, but I didn’t tell that to many people because I realized my dreams scared some people. They would tell me things like yea right, or do you know how many people make it to the NFL from Lexington, KY? Just negative thoughts that I didn’t want to become my own thoughts. So I dreamed, and I dreamed BIG. I applied action to my dreams by having great character, discipline, and consistency to reach my dreams and goals. Struggle! Struggle will happen. Adversity will happen. Both struggle and adversity will happen along your journey to reach your goals and dreams. They will happen in the short term and in the long term. But I’m here to tell you guys to have persistence and perspective as you go through any struggles you come across. As a junior at Henry Clay High School, I committed to play football at UVA on a full-ride football scholarship. Only one issue: I still had to play my senior season and not get injured before I could get on to the next chapter and next road to accomplishing my dreams! I fortunately made it through my senior season, had a great season, and didn’t get injured. But I still had basketball season, and everybody who knows me knows I played and competed at anything and everything. My dad told me not to play, but I explained all the reasons I had to play, and he basically said, “Well, suit yourself.” So I played and really enjoyed playing, but I ended up tearing my ACL in December of 2006 at a Christmas tournament, and I’ll never get over the feeling of thinking I’ve messed up everything. I was scared to tell anybody because I thought my scholarship was gone, and I’d just ruined any chances of reaching my dreams. Calling my future head coach at UVA was one of the hardest calls I ever had to make, and he assured me I was on his plans for the future and this wasn’t going to change how they saw me as a future Virginia Cavalier. Being 17 with a torn ACL and losing all my super powers(! ), I was in a depressed place, but I found hope and I found fight, and I realized you never know how strong you are until being strong is all you can be for yourself and for everyone who supports you and has your back! So in Struggle, keep your head up and understand you are strong enough to push through this! Victory! When you Dream, and you don’t let struggles detour you, Victory is inevitable. Character, Discipline, and Consistency while you Dream and Persistence and Perspective when you struggle will give you Victory, which is just the long way to say Refuse to Lose. If you want it, go get it, and don’t let anyone or any obstacle stop you! If I say I am, I will be! Then the final thing is Repeat! Keep Dreaming! Keep pushing through your struggles! And keep Winning!